A journalism student has landed a “dream job” with one of the world’s biggest football clubs before graduating. 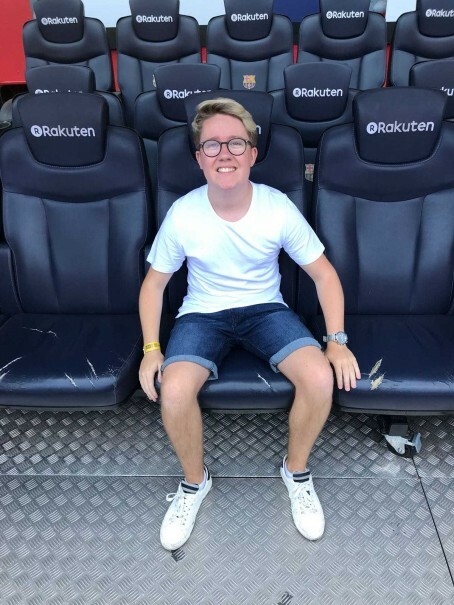 Sam May recently completed his final year of studies on the BA sports journalism course at the University of Chester and will now move to Spain to take up the role of digital media editor with FC Barcelona. Sam, pictured, attended interviews with club representatives in London and Barcelona last month before landing the role at the club, who have won the European Cup five times. The 22-year-old, originally from Warrington, previously completed work experience placements at news outlets including the Daily Mail, TalkSport, Liverpool Echo and BBC Sport as well as a week in Johannesburg, with South African Broadcast Corporation. He added: “I believe work experience was vital in helping me get the position at FC Barcelona. “This helped me to create a portfolio of varied work, which could be showcased to potential employers. David Randles, BA sports journalism programme leader at the university, said: “This is a fantastic move for Sam, and before he has officially graduated. “It is just reward for Sam’s hard work and diligence to support his studies with some top level work experience throughout his three years on the course. Amazing – well done Sam. Fascinating though to see the rips in the subs benches. You’d think they’d have the cash to make repairs if not get new ones!